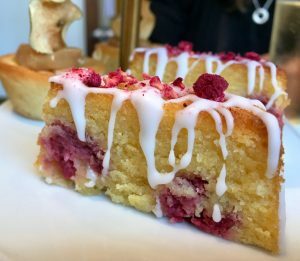 The fantastic Honeycomb cafe in Bruntsfield has launched a new fully gluten free afternoon tea. As a place that really knows how to create good food, this is a revelation as the tea is just totally delicious and comes with a glass of champagne too (if you want one and we, of course, did). Honeycomb is the creation of former Heritage Portfolio director, Ian D’Annunzio Green, so it is not a surprise that the afternoon tea is a full-on experience, bursting with flavours and colours. And for me, it was a new experience, as tea for two came stacked on plates, but so much of it is GF that my friend, a gluten-eating-professional-cook was the one with the separate plate holding a tasty looking brioche toasty. It is usually the coeliac who has the separate plate, but not here! With ten items on the menu, it was a challenge, but we rose to it. We started with a glass of champagne and then things got going nicely. 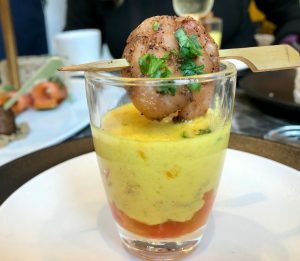 The warm treats were at the bottom, so we worked our way upwards, starting with a truly superb prawn and fennel curry soup shot – it had a wonderful colour and the flavour was a soft curry flavour with a meaty prawn to dip. I am still thinking of it now. Other warms included mini lamb koftas and a really good Isle of Mull cheddar (my favourite! ), mustard and ham toastie! While my gluten-eating friend’s brioche version looked great, mine was made with the excellent Wheat Free Bakery Direct Bread and it really was good – and on the main serving plate too! 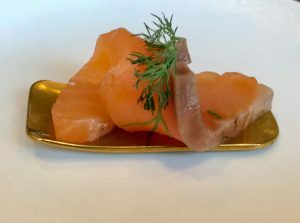 Moving on up, we enjoyed a morsel of Edinburgh Gin infused smoked salmon, beautifully presented; followed by a cream cheese and cucumber sandwich (pinkies at the ready, Your Majesty!). Gosh this tea was good! Next up was a plate of warm scones from the oven. These came on separate plates as my gluten-eating-cook enjoyed tiny “normal” ones and I had one plain and one spicy scone with jam and cream. You’ll know yourself that scones are difficult for GF, but with fluffed up cream and delicious strawberry jam, what’s not to love? A gentle fizz top-up, one cup of tea and a black coffee and we reached the end – being a bit full by now. However, the best came almost last: a seriously soft and delicious Caramelised Apple and Dulche de Leche Friand. These soft little almond cakes were just utterly gorgeous (I am off to find a recipe). 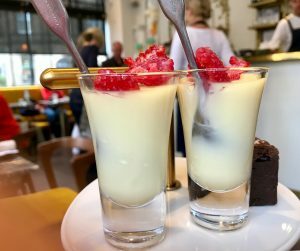 And finally, a dense and chocolatey salted brownie, a zingy piece of lemon polenta cake and the zestiest lemon posset ever, rounded it all off – with some going into a doggy bag for the chauffeur. What a way to celebrate a Friday. The Honeycomb Afternoon Tea is seriously good value at £20, or £25 with a generous glass of champagne. The surroundings are delightful, with little bee motifs, mustardy fabrics, the friendliest, professional service and some Friday vibe – the most fun group of ladies next to us really livened things up. 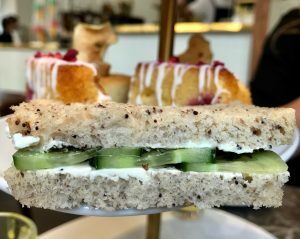 As you’ll know from my previous review, Honeycomb is a great morning coffee or lunch spot – and now it is the best afternoon tea in Bruntsfield, or possibly Edinburgh!